The Aurora Theatre continues its original purpose as a center of entertainment and enjoyment for all ages with over 3,500 visitors each month. The theatre, open 365 days a year, shows first run films at family friendly prices, hosts special events, and is available for private rental. When you come to The Aurora Theatre you will be welcomed into our large lobby complete with an old fashioned box office and concession stand. On the wall are the original Margaret Evans Price murals created for the theatre’s opening in 1925. On display in the lobby you will also find the original 35 mm projectors and equipment that were used to show movies until January of 2013. As you enter the auditorium, you will pass by the original box office and concession stand that has been re-opened to allow guests to get snacks without missing the movie. The Aurora’s auditorium offers over 600 comfortable seats. The screen is one of the largest in WNY. 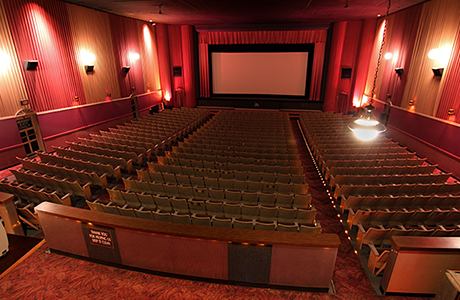 In January of 2013 The Aurora Theatre was converted to digital projection offering a wonderful picture on the big screen enhanced with Dolby surround sound. The theatre is capable of projecting dcps, dvds and Powerpoint presentations. The Aurora Theatre is a classic, vintage movie house with the amenities to meet today’s movie going audiences. Freshly popped popcorn made daily! Our concession stands offer guests a wide variety of snacks and drink to enjoy. We also have pretzel bites, nachos with cheese and jalapenos, and gourmet popcorn and popcorn seasonings! A large venue, seating over 650 patrons, the Aurora Theatre has hosted many live shows, premiere events and motion pictures to the delight of generations© 2017 Aurora Theatre. All Rights Reserved. Website Design by OtherWisz Creative.